The engine had not been run since its landing in the corn field. I decided to give it a run before doing much else to see how it went. With the help of Ray we managed to get it started. This was my first attempt at hand proping an engine so it was interesting to say the least. Eventually it started and the oil pressure came up to 35psi. A good start. After a warm up I couldn’t get any more than 1100rpm. The engine also started to backfire slightly. I felt the exhaust pressure from each side of the engine and found that the port side had quite a lot less pressure than the starboard side. I shutdown the engine and I felt the cylinders, One was cold, the others good and warm. A quick (thumb over the spark plug hole) check revealed the was no compression on No 2 cylinder. 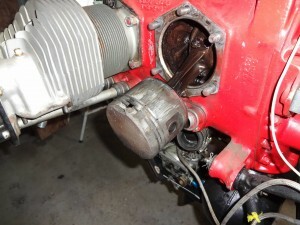 I took the cylinder off and found a hole in the piston. Now I know why there is a lack of compression!!! 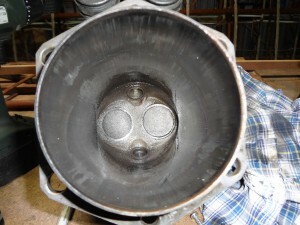 Piston with a hole in it! 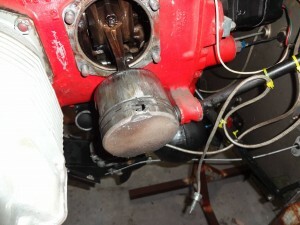 This is the piston next to it. I have since disassembled the complete engine. 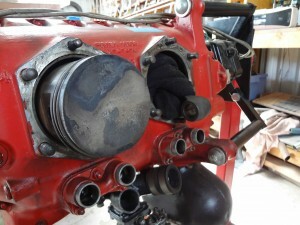 Apart from a very good clean, new bearings, new piston and a clean of the cylinder seems to be all that is needed.